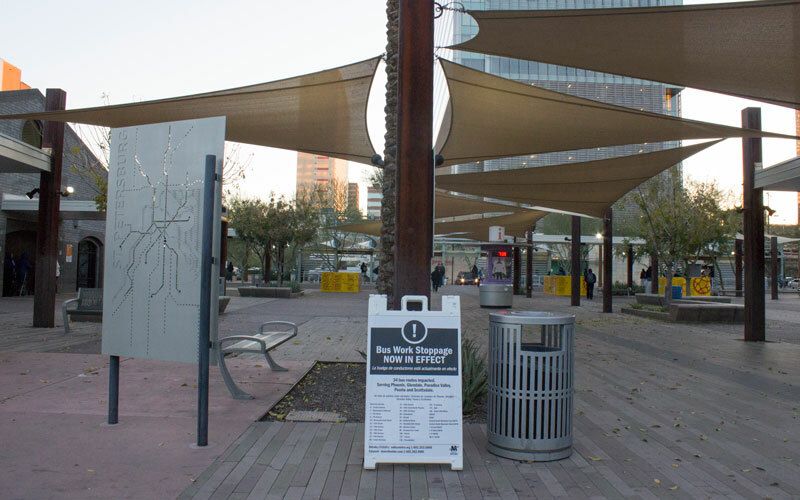 A sign at Central Station in downtown Phoenix displays the bus routes that have been affected by the Phoenix bus driver strike on Thursday, Jan. 14, 2016. The strike began on Jan. 8. The eight-day bus strike that left thousands of passengers stranded raised questions about whether low income families can depend on the nation’s sixth largest city for their transportation, according to critics. The bus strike ended Saturday with transit company Transdev recognizing drivers’ requests for higher-quality restroom access, among other pleas, according to the Arizona Republic. Low-income riders were particularly impacted, with limited alternatives for transportation during the strike, according to Christy McClendon, president and CEO of nonprofit organization New Pathways for Youth. Forty percent of riders — or about 28 million of the 70 million total rides taken in fiscal year 2014-2015 — live on annual household incomes of less than $20,000, according to a 2012 Valley Metro survey. The city’s main consideration in the aftermath is clarifying the requirements in contracts with companies like Transdev, which operates local routes and was the source of driver complaints that culminated in the strike, according to Brenda Yáñez, public information specialist for the city’s Public Transit Department. The current service is under a recently signed five-year contract, which means no changes would be made to the city’s rules until 2020. Lack of public transportation had a ripple effect on low-income families’ ability to manage their already limited resources, McClendon said. McClendon mentors Michelle Zamudio, 15, who missed tests in her biology and geometry classes at North High School when buses stopped running the date the strike began, Jan. 8. Zamudio wasn’t aware of the strike and learned about it too late to find alternative transportation to school. Her family doesn’t own a car. Her home is almost two miles from her school, with no school bus route nearby. Riders like Zamudio cannot afford a taxi or ride-share company and do not own cars. Drew Rodriguez, who lives in an extended-stay hotel with his wife and 9-year-old daughter in north Phoenix, was unable to attend his daughter’s end-of-quarter school awards ceremony, a regular event he had never missed. Rodriguez said his family relies entirely on public transit. Rodriguez and his wife do not work, relying on $1,700 monthly in disability payments from social security and food stamps. For them, a $30 taxi or Uber round trip to the grocery store under five miles away is too expensive. Valley Metro communications manager Susan Tierney said there were options for low-income riders whose bus routes were impacted, whether finding another route in the area, asking friends or neighbors for a ride or using a resource such as sharetheride.com, which matches commuters to help them find transportation options such as carpools or vanpools. “I think everybody understands that we have to kind of pull together in a time like this,” Tierney said. But for Rodriguez’s family, options like these are unreliable. The majority of his neighbors also depend on public transit. He has no contact with family members, and all the routes near his home were either canceled or on a limited Saturday schedule during the strike. Though the Route 27 bus near Rodriguez’s home was running with limited service by Tuesday, according to a city of Phoenix press release, Rodriguez’s family still faced spotty bus arrival times. His wife waited two hours for the bus on Wednesday after grocery shopping, he said. She eventually walked three miles home carrying bags of groceries despite pain from lupus and previous hip surgery. Other organizations offered some options for riders like Rodriguez. Ride-sharing company Uber tweeted a link for new riders to sign up using a promotional code covering $20 toward the first ride. 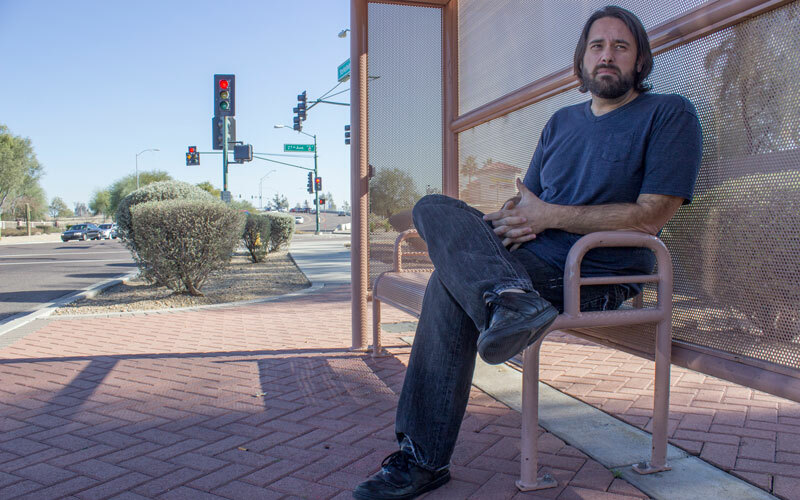 While Valley Metro offered some limited options for riders like Rodriguez, the real solution, Rodriguez added, would come from the city pressuring both sides to end the strike as quickly as possible.